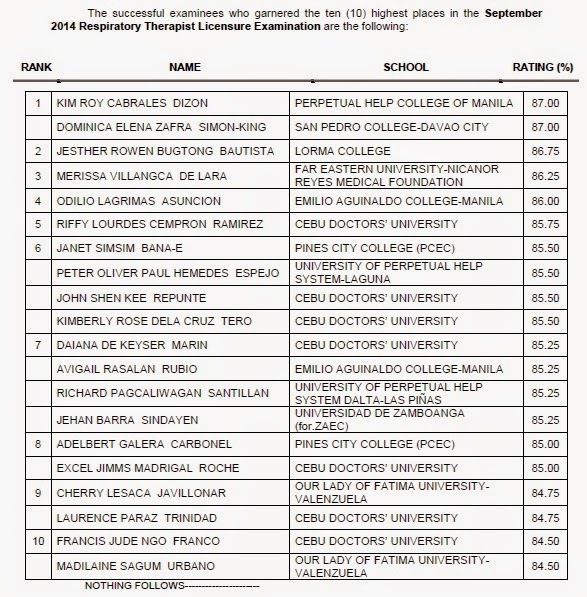 The Professional Regulation Commission (PRC) officially released the list of passers for September 2014 Respiratory Therapist board exam. Kim Roy Cabrales Dizon from Perpetual Help College of Manila (PHCM) and Dominica Elena Zafra Simon-King of San Pedro College- Davao City topped the board with identical 87.00 percent grade. Jesther Rowen Bugtong Bautista of Lorma College placed second with 86.75 average grade.